On DVD today. June 11th, the journey to a wondrous land of enchantment and surprises when a classic tale gets a brand- new twist in a full-length adventure that follows Minnie Mouse and the rest of the Clubhouse pals as they visit the strange and wonderful world of "Dizz" in Mickey Mouse Clubhouse: Minnie's The Wizard Of Dizz! My kids just love Mickey Mouse Clubhouse. 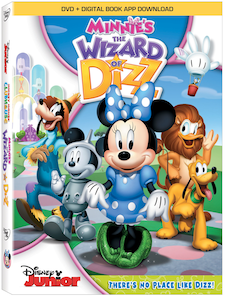 When we had the opportunity to review the latest DVD, Minnie's Wizard of Dizz, I jumped at it. Not only does this include some of their favorite characters, but it's also a version of one of my all time favorite movies, The Wizard of OZ! In this cute story Minnie's character is suppose to be portraying the lovely Dorothy. Filled with not only a great story line, but also keeping to not only the story of the Wizard of Oz, but also the Mickey Mouse Clubhouse's theme where they get the kids involved and ask for their help as well. The beginning of the movie starts off like any other regular day in the Mickey Mouse Clubhouse and then a tornado hits and takes Minnie and Pluto away to the land of Dizz. Your kiddos will share lots of laughter and sing along with the characters as well. This is definitely a DVD to have in your collection and it's out in stores today, June 11, 2013! Along with our giveaway to win your very own copy of the DVD for your little one, be sure to check out these free activity printables as well! Disclosure: All opinions are my own. I received Minnie's Wizard of Dizz on DVD at no cost for the purpose of this review. No other compensation was received.